Pocahontas is a well-known and much-loved animated character. She is a Disney princess who is very different from other princesses. She first graced the silver screen back in 1995 with her first feature film and then again in the 1998 Sequel. And since then she has inspired plenty of tattoos! She is instantly recognizable and looks quite different from the usual Disney princesses with their glamorous outfits and hairdos. She is always portrayed barefoot for starters and is the only Native American princess. While other princesses wear plenty of earrings and jewels, her only accessory is a blue necklace. Her skin is a creamy cappuccino shade and she has deep brown eyes and long raven black hair. She is also the only Disney princess with a tattoo! Yes, the tall, slender beauty sports a red tattoo on her right bicep that looks a little like abstract fire. In the stories, she is part of the Powhatan tribe, but not everything about her is fictional, she is actually based on a real historical figure of the same name. And her looks were inspired by famous 90’s supermodels Naomi Campbell and Christy Turlington. And the meaning of her name? It means “Little Mischief” – quite fitting for this adventurous young lady! Ladies are more likely to choose a Pocahontas tattoo than men, simply because of the subject matter. Women are more likely to relate to the Disney princess and admire her many qualities. Here are some of the meanings commonly associated with this type of tattoo. Wisdom – Although she is a young lady Pocahontas shows great wisdom – definitely well beyond her years. Getting a tattoo like this may represent knowledge and spirituality. Kindness – This princess has a gentle and caring soul and loves all the people and animals around her. A tattoo of her could represent kindness, gentleness, and compassion. Adventure- There is one thing we know for sure – Pocahontas is curious (and a little mischievous!) and always ready for an adventure. For a woman who loves traveling and seeking new experiences, a Pocahontas tattoo would be a symbol of an outgoing personality. Independence and Bravery – She is not a weak princess who needs to be rescued. In fact, she is more likely to be the rescuer! 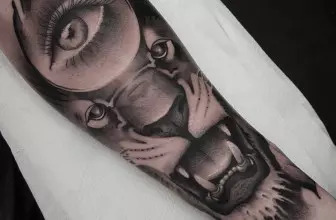 A tattoo like this is a totem of boldness, bravery, and a strong, determined will. Those who feel they are free spirited and even wild could find themselves hankering after a Pocahontas tattoo! Nature Lover – If you feel a strong connection with nature, then a Pocahontas inspired tattoo could be just what you are looking for. When someone sees your tattoo they will definitely know that you love animals and nature. Leaves or Feathers – When Pocahontas sings during the movies she is often surrounded by whirling leaves and feathers. She has a deep connection with nature. 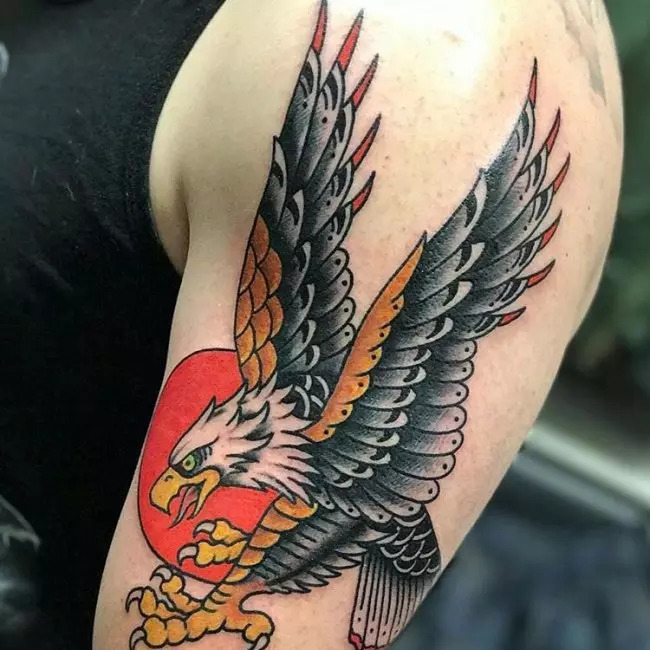 These tattoo designs are usually quite colorful, with plenty of movement and will sometimes include birds or butterflies. The feather is also a popular subject which is very symbolic of Pocahontas and her understanding of nature. Red Armband – It’s not commonly requested design but some clients wish to replicate the Disney princess’s armband tattoo. This is usually done in red or orange ink to match or in solid black with additional patterns. Portrait – The princess herself makes a fantastic tattoo. Clients will usually have a portrait picture of her in full color. Most designs include her bust and head or they can be drawn as an outline or silhouette. Spinning Compass – In the movies, the spinning compass, which initially belongs to Pocahontas’s love interest John Smith, has special significance. Compass tattoos look super interesting and to keep with the theme you could add leaves or feathers to the design. This kind of tattoo would work in solid black, although most clients opt for a more colorful design. A compass itself is symbolic of finding direction. Quotes – There are lovely sayings packed into the movies and their songs and these can also be included as a script in these types of tattoo. The last one is quite romantic because those are John Smiths words to Pocahontas. 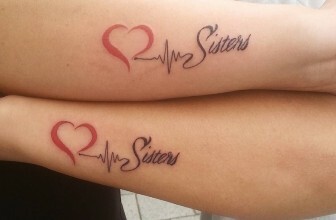 These types of script tattoo designs will often include leaves or feathers. Abstract designs and tattoos with the watercolor technique look amazing and bring the theme right on trend. These techniques can really help to make tattoo subjects such as the leaves, feathers, or compass stand out. The spinning compass tattoo could also be designed as a three-dimensional piece. Compass and portrait type tattoos usually look better if they are large so the best placement for these would be on the back, upper arm or leg. The Pocahontas leaves and feathers inspired pieces can be placed just about anywhere and make cute designs for your lower arms, shoulders, and feet. Those who wish to have a copy of the Disney princess’s tattoo will do so around their bicep, but also sometimes as a wraparound design on the thigh or even a finger. Pocahontas is certainly a unique individual and has plenty of admirable attributes. She is a fantastic example of a kind, but strong-willed young women who is in touch with nature and those around here. As you have seen there is a range of Pocahontas inspired tattoos to choose from and they all carry special significance. There are many meanings associated with these tattoos and they are more likely to be chosen by someone who loves this cartoon figure and admires her spirit. These designs will also not age – the movie is almost twenty years old and she is still a well-recognized figure and that’s not likely to change. If Pocahontas is your heroine then one of these inspired designs will showcase your love for her as well as your love for nature and the world around you.